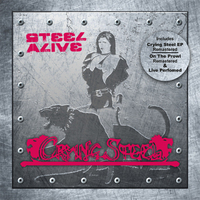 CRYING STEEL originally formed during the early 1980's in Italy and has existed on and off ever since. The band has released a number of demos, an EP and five full-length albums over the years. "Steel Alive" is their latest offering. It's actually what used to be called a "double album", which means that it has twice the amount of music that most albums contain. At 28 tracks long this release does take some considerable time to listen to from beginning to end. Admittedly, the somewhat odd and confusing track order doesn't help with the situation. I have never encountered an album where two versions of the same song (one a studio version, the other a live track) are listed in such an odd manner. I wonder if the band or their producer even considered a more traditional approach where the studio versions are featured first followed by all the live ones afterward. So rather than giving you my impression of every single track on here I will mention the ones that stood out the most while I was listening to them. I really enjoyed the first track, "Ivory Stages". It reminded me of METALLICA'S early music with a fast and thrashy intro that led into a great old school Power Metal song with lots of Heavy Metal influence throughout. The sound of it was very classic; think of how Heavy Metal sounded prior to 1983 and you'll get the idea. The live version of the song "Hero" was excellent as was the live version of "Where The Rainbow Dies". In both cases I was pleasantly surprised by how polished the band sounded. Most bands suffer a bit with their sound while playing live, but not CRYING STEEL. With a couple of exceptions I thought they sounded better live most of the time when compared to their studio recordings. "Running Like A Wolf," "Struggling Along," "Alone Again," "Changing The Direction," and "Shining" are all excellent as live tracks. The energy and pace on all of those songs improve when they're played live as opposed to how their studio versions sound. I haven't heard many bands who can make that claim so the members of CRYING STEEL should feel pretty proud of themselves. The tracks that I didn't care for that much were "Upright Smile," "Fly Away,"and "Thundergods". They reminded me too much of the days when "Corporate Metal" reared its ugly head as executives with the record labels started to decide what sounded good and what did not. I don't like it when Metal music sounds choreographed and thoroughly rehearsed. Metal is meant to be organic and a bit rougher sounding than other genres; otherwise, it's nothing more than Hard Rock with a Pop music twist, and who needs that? Not me and, hopefully, not you, either. Overall I liked "Steel Alive". It's a long album, but it's also a great example of Power Metal in the 21st Century. If you grew up during the 1980's you should add it to your collection. It will take you back to a simpler time as you listen to it and it will reassure you that the genre is still alive and well even now.